Easiest 3-step no fuss place for your first business page in 10 min. Looking to make a web site? Setting up a web site is still daunting for a lot of people, its either the high cost involved, technical complexity or the content that needs to be collected! Business mnation allows businesses to have a simple online page, with the essential information like business name, what you do, address and phone number available - in 10 minutes. Not wanting to limit you, you can also have pictures, a short description about your business, a link to your web site, opening hours, tags, and if you take card payments etc. You also get to choose what your page address (URL) and you can advertise it on your business cards and other material. Once you have signed up, you are allowed to post a message that shows up on the main business mnation page that would be visible to users visiting from your city. To make things simple, every time a business claims or adds a location, it is submitted to Google and Bing with the business name, category and location. 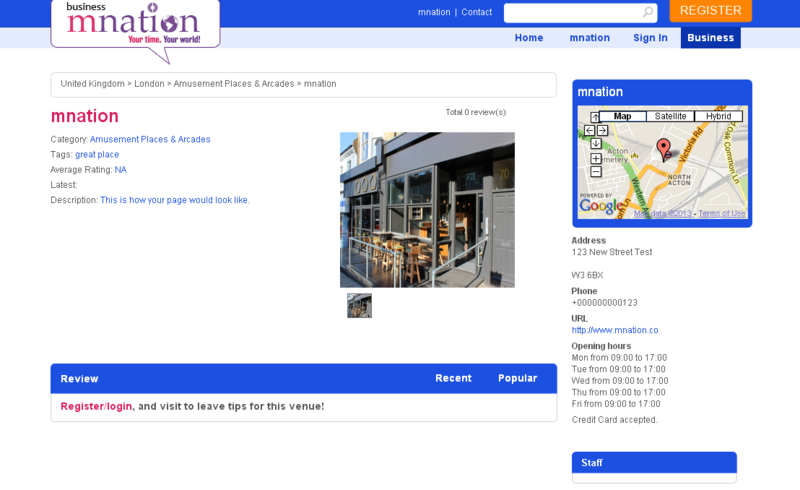 So anyone looking for your business or related category will quickly get to your mnation page. Let's make it sweeter, mnation has a user section, where people look for places or businesses from their cell phones - your business shows up to people looking for places closeby when they are actually looking to make a purchase - when it matters! What is most interesting is that although business mnation allows your customers to post reviews about your business - but only if they have actually visited your business to be able to post reviews. If you don't want reviews to show up, you can switch off individual reviews. 6. Latest updates appear on your city home page for free (upto 24 hours). 7. Have multiple locations and assign managers and staff to it. 8. See who and how many people visited your location. 9. Add tags to enable easy searching by users. 10. No long contracts - cancel any time! 11. Show your location on a map OR choose not to! 12. We do the SEO! 13. Pay easily with paypal. Many other exciting features on the way! Want to see how your page would look like? Click here to see a sample business mnation page. - No designer or additional costs required. - No need to hassle with a developer. - No content to write or writer to deal with. - No hosting or hidden costs. - No hassle and one bill to pay! - Be online instantly - in just 3 steps! Register or claim a location for only $10 per month. For a limited time only! Start your 30 day free trial now! With the open day approaching, I did not have time to brief a designer or developer for my web site. In 15 minutes I setup a page on business mnation with the most important details and left the actual web site work for after the opening of the playgroup. - Kiran P., Evolution Playgroup. Copyright 2015 mnation all rights reserved.